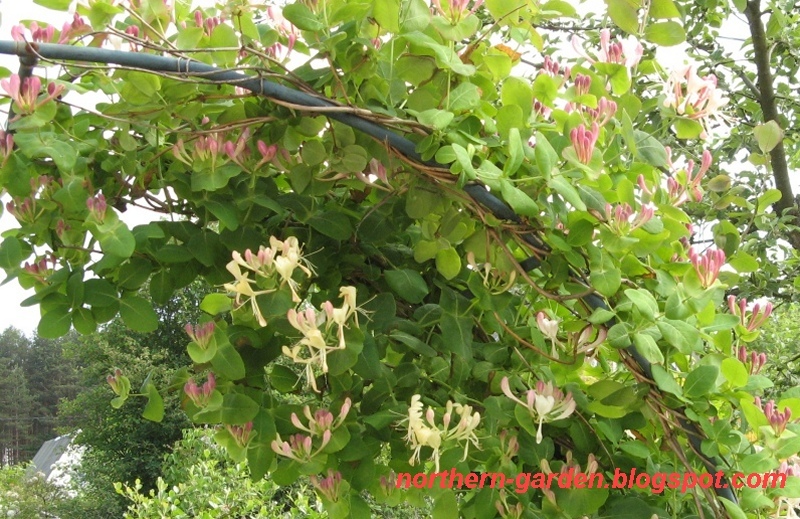 Climbing plants are widely known, thanks to the accelerated growth of their shoots, which are mounted on support structures. We quickly realized that vertical gardening is a very exciting experience. My husband and my son have built trellises and a pergola in our garden. The choice of lianas is large enough; we had only to decide which of them will grow well in our climate. We also decided to divide space with the trellis, to create a garden pond area and to decorate a path along the house with green arches and pergola. 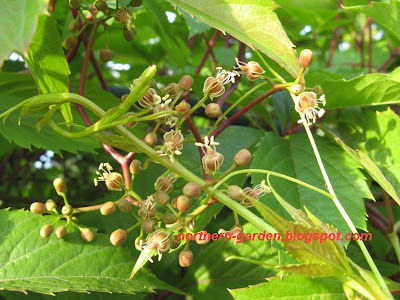 The first year we planted Virginia creeper (Parthenocissus quinquefolia), Honeysuckle (Lonicera caprifolium) and clematis (Clematis х Jackmanii) near trellises and pergola. 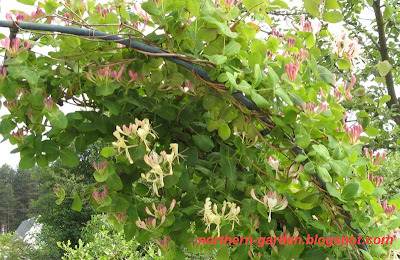 Clematis blooms once a year, for a long time before frost. It grows fast; its large purple flowers adorn the Vine (Parthenocissus quinquefolia). A year later another lianas came : Actinidia kolomikta, Oriental bittersweet (Celastrus orbiculata) and sweet peas. Celastrus orbiculata is also liana, with dense branching and foliage. 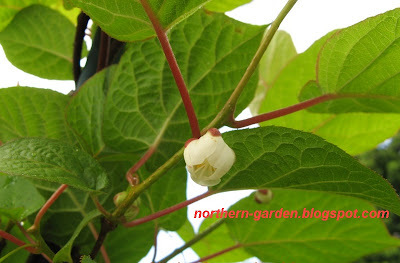 Leaves are dark green, flowers are small, greenish. 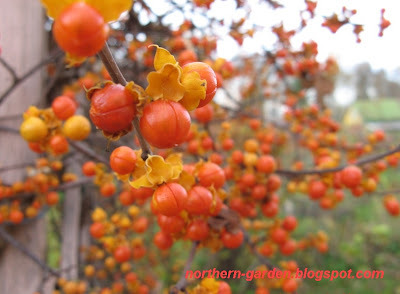 In the autumn it has bright yellow or orange berries that remain all winter on the plant. All our planted lianas are well and hardy. My favorite is Celastrus orbiculata, because quickly fills the entire trellis space, has no pests. I constantly direct its young shoots to the trellis direction. Last autumn it began to bloom, bore berries. I plant annual sweet peas in a large pot. 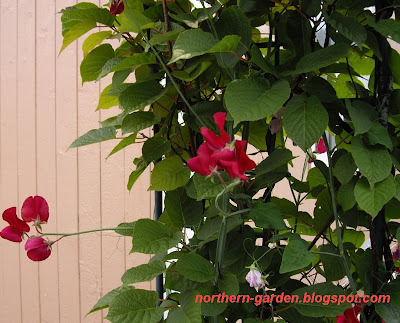 I put it next to the Actinidia, and sweet peas completely twine all the Actinidia shoots. Thank´s for your comment on my blog. If you want English translation of myblog you can push button in the right column and choose language .It´s not so god translation but perhaps you can understand a little what I write about. I hope that you will come back to my blog. I like a lot climbers in the garden . Clematis are my favorites. It's nice to meet someone from so afar - in Russia - through these blogs. Blogs really bring us closer together. I am very much interested to know your weather there. Do you get lots of snow and long winter?